6 Items To Improve Your Sleep! Sleep is something we can’t live without, yet sometimes it’s harder than you realise to get the amount you need in order to stay at your healthiest and most refreshed. If you’re someone who struggles to get enough sleep, get to sleep in the first place or stay asleep for the whole night, have a look at the items below to start making some much needed improvements! 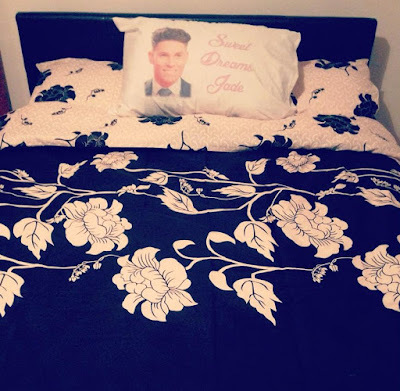 When Gareth's not staying over, I love snuggling up to my pillow of Joey Essex! Pillows are important for rest, and having the right ones can aid in improving your overall sleep. Wool pillows are an ideal pillow material wise, as this product is breathable, gentle on skin, and won’t lose its shape. There are a variety of companies around, such as MiniJumbuk, that specialise in wool products. Herbal pillows could be another option, as certain scents such as lavender can create a feeling of calm. External noise can be an issue for many people trying to get to sleep, and this is where a set of speakers comes in handy so you can create the right kind of noise for your comfort. Background noise is distracting, but soft music, white noise or ‘nature’ sounds can promote relaxation and reduce worrying. Noise of any kind can often be a problem for some people, so music or calming sounds might not be the best option. This is where ear plugs come in handy, as they will block out most sounds, including ones that are close by. Ear plugs are also a great option if you need to block noise but you share your room with another person, as they might not appreciate your sleeping soundtrack. Your mattress is physically what you sleep on, so it makes sense to make sure it is exactly right for you and your body. Try not to have something too soft of too hard, or made from a material that will get out of place easily. Adjustable beds and mattresses are ideal for helping reduce pain in some people, or you could try mattress pads or toppers for added comfort and support. If your room is stuffy, sleeping becomes even more difficult as your body also becomes congested. Air purifiers are a great idea to freshen up your sleeping space and are particularly beneficial for those who suffer from allergies. Aromatherapy can also help improve sleep for some people, as the scents of certain essential oils promote relaxation. One of the key elements to getting a good night’s sleep is making sure the room is dark enough for your body to relax and switch off. For example, a bright street light or other lights still on in the house can be distracting, so using an eye mask will help to create a completely dark space for easy resting. Also, this product is particularly useful for shift workers or other daytime sleepers. Sleep doesn’t haven’t to be a stressful or difficult routine – it should be enjoyed and appreciated as it has enormous benefits for your physical and mental health. By utilising the benefits of some of the simple items above, you could be having a great night’s sleep every night. 5 Tips To Enjoy a Weekend In The Capital. Breaking The Silence, Shouting Out Loud. Cosying up for the Winter Weather. Miniature Bakes With Choc Nibbles! How To Throw A Successful Halloween Party! Halloween 2015 With Cake Angels! How To Make A DIY Halloween Candy Stand! Transforming a Bathroom For Halloween! Halloween with Holland & Barrett! How To Survive Christmas as a Divorced Parent. The Best Loire Valley Castles to Visit with Kids! Why I'm Really Looking Forward To Christmas! Can You Travel While Pregnant? How To Save Time Around The House! Blogger Tips: Why Comments Can Give Broken Links! Looking At The Bigger Picture In Your Home. Planning A Baby!? Then Start Saving Them Pennies! Win A Years Supply Of Cadbury's Heroes!